Hooray and alas, thanks to one of Baltimore’s premiere p.r. gals, Randi Rom, I was invited to try a new place (for me) for brunch. It is Sam’s Canterbury Café, 3811 Canterbury Road at 39th. It’s open seven days with that brunch on Saturday and Sunday, served all day. It is a quaint place that opened about a year ago. What makes this restaurant a little different is that it’s partnered with a non-profit called Itineris, who supports job placement for the autistic. There are actually folks with autism working there full and part-time and doing a great job. As an aside, April is Autism month and the café will be celebrating all month with special promotions. They’re calling it Sam’s Canterbury Goes Blue. When inside you will order from the counter and the food will be brought to you. You will find a barista menu consisting of coffee and espresso, teas and steamers and signature lattes. 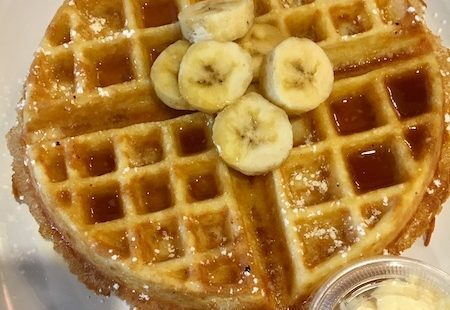 The brunch menu consists of classic waffles, jalapeno-cheddar waffles, berries and chocolate waffles and my choice waffles banana foster. There are also omelets. For lunch, you can order a curried chicken salad, house tuna salad, thankful turkey, vegging out, California clubhouse chicken along with salads, soups, flatbreads, bakery items, many of which are made right there, and dessert. There is a gluten-free option with some of the desserts. I’m told a very popular dish is the curried chicken salad. Breakfast is served all day. In season there is outdoor dining. You can carry out, order online and they offer limited off-premise catering. The artwork on the wall, done by autistic artists, is for sale. Some new menu items will be added in April. 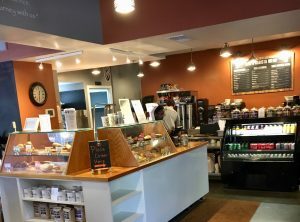 OK, here’s what I really liked about the café – the food was quite good, the room is small and cozy, the owners are doing a great service by providing employment for autistic individuals and it’s in a great neighborhood. I don’t get over to that part of town too often so I spent about 20 minutes admiring the beautiful houses and apartment buildings. As printed on the wall, their credo is simple, ‘committed to serving quality food and drink, while providing meaningful employment for individuals with autism, on their journey toward independence. We invite our guests to enjoy this journey with us.’ I invite you also. Reach them at 443-438-4545 or at samscanterburycafe.com. Now let’s venture into Baltimore County and visit Ristorante Firenze, 2 Hanover Road, Reisterstown. It is owned by two seasoned restaurant guys, who are brothers, Larry and Brian Leonardi. Open seven days, plenty of free parking, seats about 100 (including bar) and with plans to open a beer garden in the back, possibly by the end of April. It is a neighborhood kind of place so it is casual, I would suggest weekend reservations, you’ll find live entertainment Thursdays from 6 p.m. to 9 p.m. and most of the food is homemade. On my last visit, I was watching Larry in the kitchen tossing sauces, cutting veal and chicken, slicing veggies and singing. I was wondering if he was hiding some chianti nearby. When I finally got him seated he told me the menu will be expanding slightly very soon. OK, like what? Seems like steak and chops will be coming. When asked about signature items he mentioned right away the eggplant caprese tower, which is actually an appetizer. That’s fried eggplant, fresh mozzarella, tomato pesto and balsamic drizzle. On a previous visit his son, happens to be the chef, made me an outstanding salmon dish. This time around I had the chicken marsala. Saturday and Sunday from 11 a.m. to 3 p.m. there’s a brunch, Happy Hour weekdays from 3 to 7, Wednesday is Wine Night (half price bottles), they’d be happy to cater your event and they will be participating in the Taste of Carroll (County) April 30. This raises funds for Carroll Hospice. This is a very comfortable restaurant run by two very capable guys. I think it’s worth a visit. Reach them at 410-394-5577 or at eatfirenze.com. ← Should Trump meet with North Korean dictator Kim Jong Un?